We get it. You enjoy the attractions, food and entertainment, but you come to Myrtle Beach, South Carolina, for the beach! And why not? We have one of the largest stretches of sandy beaches on the East Coast and the Atlantic Ocean is warm and inviting. Luckily for visitors to Myrtle Beach, we also have a vast array of accommodations with gorgeous ocean views! There’s something for every taste and style. Here are a few of our favorites for you to consider. 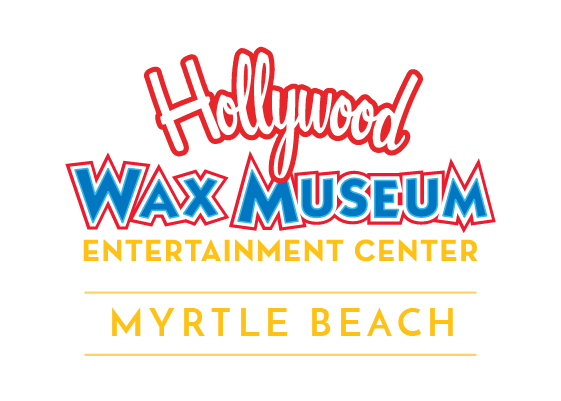 And, while you’re in town, don’t forget to visit Hollywood Wax Museum Entertainment Center! We’re open 365 days a year and are ready to entertain you from 9am until well past sunset! 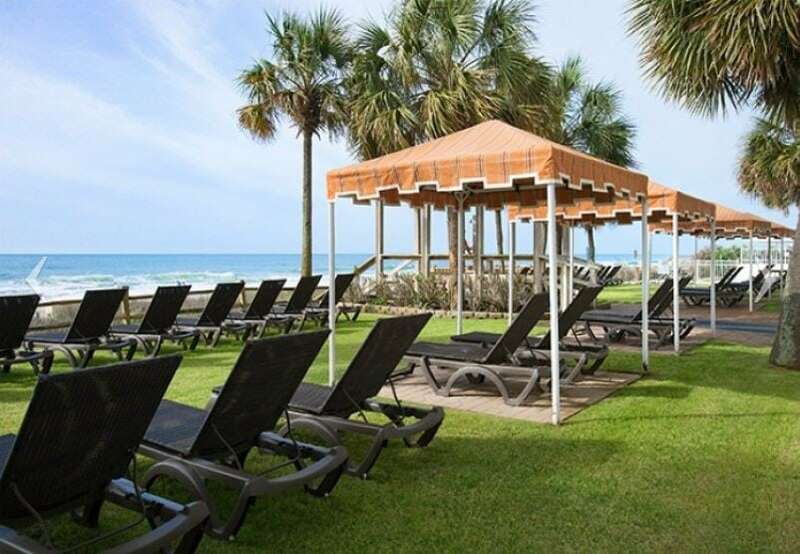 Grand Dunes Resort & Spa – Located just steps away from the ocean in beautiful North Myrtle Beach, you’ll find the Marriott Grand Dunes Resort & Spa with spacious rooms that overlook the breaking waves. Spend your days lounging poolside under the palm trees or rocking on the beach-side hammocks. Then, venture to the Hibiscus Spa, featuring a full menu of wellness services. For dinner, dine at Ocean’s on 82nd and savor excellent international cuisine and dramatic ocean views. Dunes Village Resort – At the Dunes Village Resort, it won’t matter if you visit in the summer or winter, or if it’s sunny or raining. This place has plenty for families to do and much of it is indoors! Yes, it’s right on the beach, has an outdoor pool and lazy river and has comfy rooms, but the star at this hotel is the indoor water park! Kids will enjoy the slides and pools, plus ping pong, shuffleboard, pool and all sorts of arts and crafts throughout the day and into the night, all while protected from the weather! 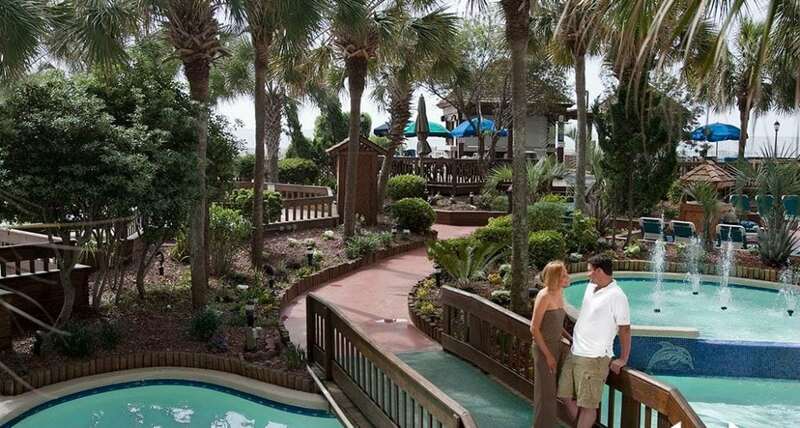 Carolina Winds Resort – It’s true that the hotels in Central Myrtle Beach are closest to Hollywood Wax Museum Entertainment Center, but that’s not the only reason we suggest the Carolina Winds Resort. 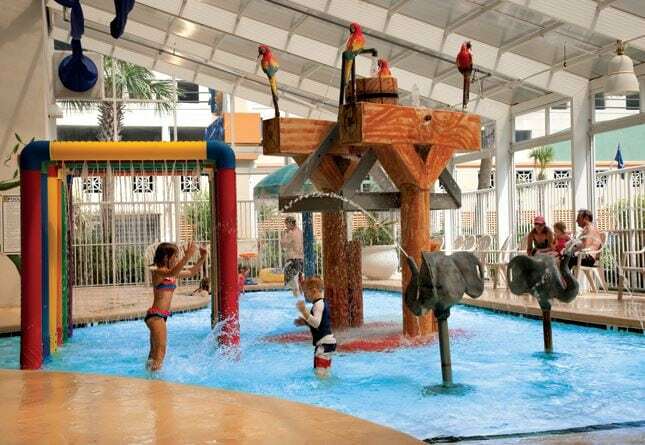 This family-friendly resort is also close to downtown Myrtle Beach with its bustling boardwalk and SkyWheel, plus many other nearby places to fish, play mini-golf, parasail, shop-til-you-drop and much more. Indoor and outdoor pools, a game room and an oceanfront lawn area are sure to keep you happy while at the resort. 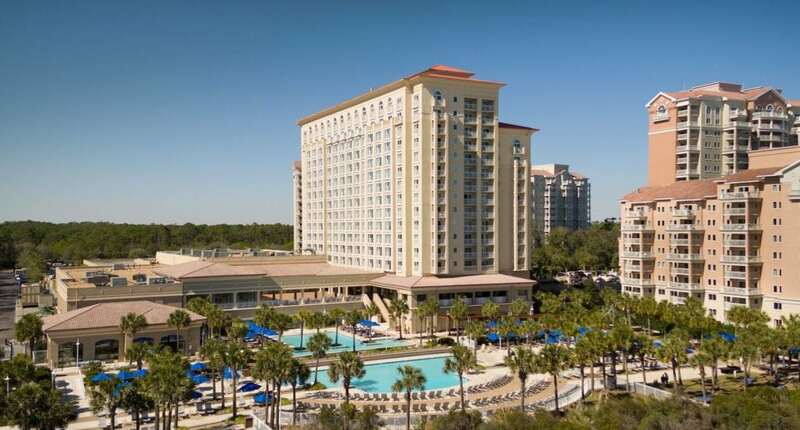 Beach Cove Resort – A tropical outdoor pool deck with lush landscaping, erupting fountains and plentiful palm trees is just one of the reasons we love the Beach Cove Resort. If you’re in it for the water, you’ll find three heated outdoor pools, a 350-foot lazy river, an outdoor kiddie pool, three oceanfront whirlpools, plus an indoor pool and whirlpool at this hotel. Hotel BLUE – In a town that caters to families, it’s great to find hotels that also offer grown-up accommodations and amenities for couples and singles without kids. The chic décor and comfortable guest rooms are lovely at Hotel BLUE, but it’s the swim-up bar that keeps visitors coolest during hot beach days. The Strand – It’s not exactly the typical small, independent hotel that is usually associated with being a boutique, but as boutique hotels in Myrtle Beach go, this is sure to satisfy. From oceanfront bedrooms to two-bedroom deluxe condos, The Strand has space for parties of any size. Sit poolside or soak in the rays and crisp sea air on the hotel’s tanning lawn.